Any profession that can impact life and safety and that requires interactions with other life safety professionals (i.e., nurses, paramedics, EMTs, and physicians) requires skills, knowledge, and a commitment to that trade. This is also true of rescue technicians. These abilities don’t accrue overnight; they require years of dedicated study and participation rescue drills and skills exercises. 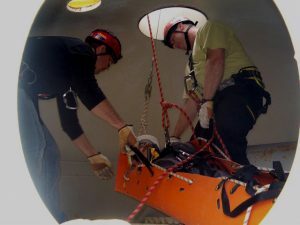 Students extracting a packaged patient in a confined space training prop with SKED. A key attribute of a dedicated rescue technician is attention to details. Let’s examine the basic building block of a rope system: tying a knot. Every characteristic of rope rigging can be found within a knot. A knot by its very nature is a basic anchor. Something is connected to it, or is being held in place by it. Like all anchors, they are not supposed to move (unless we purposefully engineer them to move). This is why we must tie them as well as they can be tied: cleanly dressed and soundly set. This ensures we are engineering unwanted movement out of our little anchors. Beyond the physical attributes of compression, tension, friction, and resultants, by looking at a knot we can also determine a rescuer’s commitment to his or her craft. Knots tied by the rescue technician are appropriate for the application, tied exactly the same way each time, have a small (or appropriately sized) gain, are well-dressed, and soundly set. By affording attention to these seemingly small details, then solid rigging habits are formed. It is those solid habits that carry over into an actual rescue when stress can make any simple action seem overwhelmingly difficult and complicated. Register for a Technical Rope Rigging class by calling (800) 551-8763 or visiting our Rescue Class pages.